We clambered out of the van and huddled in the driveway, a dozen eager diners of varying ages hungry for a promised feast but uncertain that we were in the right place. There, in the middle of a tidy, quiet residential neighborhood in Angeles, Pampanga, was where we'd been told we would find Kapampangan cuisine unlike any served in Manila restaurants. Yet, it felt as if we had arrived for lunch at a relative's home. Only the colorful carved wood sign above the gate confirmed that we had found the spot: Bale Dutung [BAH-leh Doo-TOONG]. If it seemed as if we had simply been invited for a home-cooked meal, there's good reason. 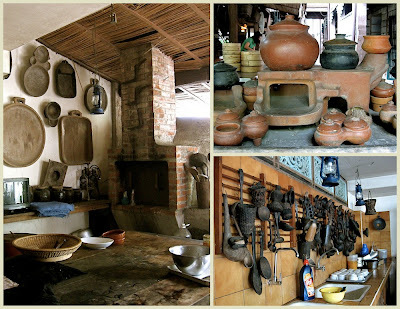 Bale Dutung, or House of Wood in Kapampangan, is first and foremost the home of Claude Tayag, whose list of talents and accomplishments reads like a Renaissance man's resumé: painter/sculptor/furniture maker/collector/food writer/author/world traveler/chef. In 2000, he and his wife Mary Ann opened Bale Dutung's gate to diners searching for a multi-sensory food experience that presents the traditional with a modern sensibility. 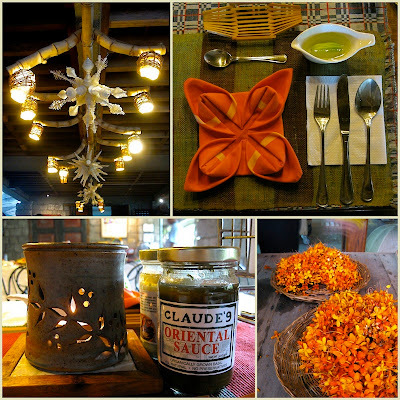 At first, they did so only once a month, but as they gained renown for their authentic preparations of classic Pampanga cookery and became an epicurean's destination, the couple began offering more openings, though still strictly by advanced reservation. 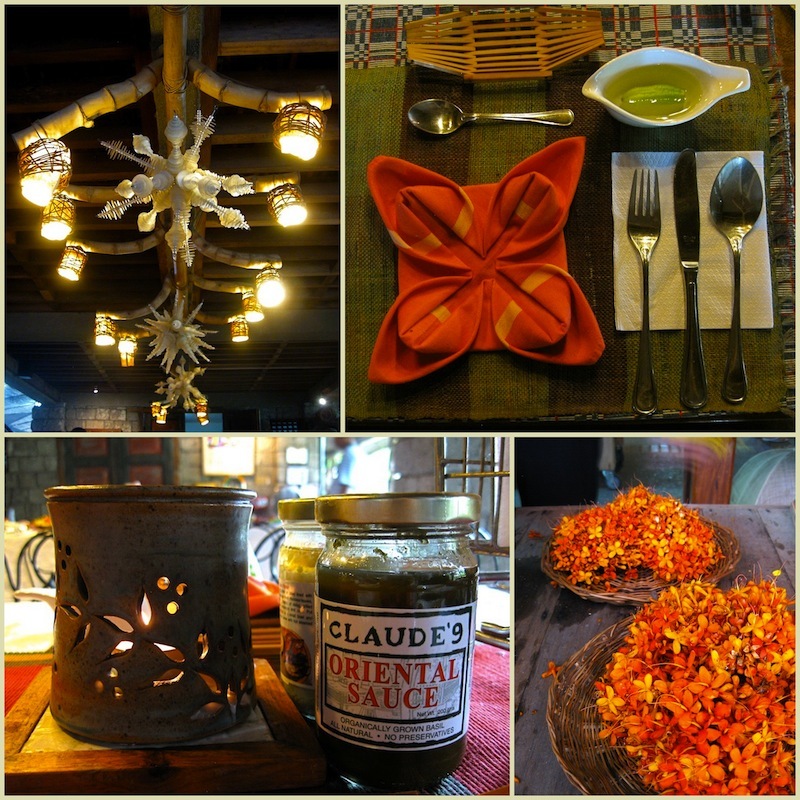 But make no mistake: Bale Dutung is not a typical restaurant and what they serve is no ordinary meal. Stepping through the front gate, we left behind the manicured suburban setting and found ourselves in a verdant garden shaded by a canopy of trees and lush foliage. 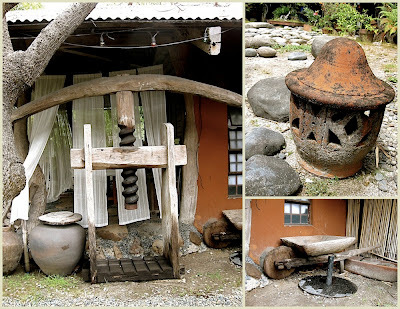 As we approached the house, we passed artifacts from Claude's carefully chosen collection of farm implements: old clay pots, an ancient wheelbarrow and what appeared to be a giant wooden corkscrew (the purpose of which is still a mystery to me). The pebbled ground beneath our feet brought to mind a dry riverbed leading to a small oasis guarded by a Pan-like sculpture playing a silent serenade to the House of Wood. Framed by snaking vines and darkened from the inside, the building's weather-worn façade belied the fact that its construction was completed just over a decade before. Claude, ever appreciative of beauty and utility in all things, used salvaged material - wooden beams, adobe blocks, intricate wrought-iron - to build his home, giving it an aura of gentle antiquity. Wood steps and spiral staircases leading to the Tayag's living space on the second floor bore discreet signs reading 'Pribado' (not public), but the silong (lower level) was fully open to guests. From outdoors, we stepped directly into the airy dining room, where cool stone and warm wood carried the garden's ambiance inside. The space was suffused with subtle light from fixtures made of bamboo and seashells set into the rafters overhead and from the sunlight outside, glowing softly and unobstructed by walls. Columns of stone blocks were plainly adorned with a feng shui mirror here, a framed photo of our hosts and famous guest Anthony Bourdain over there, but along the periphery of the room, there was so much more to see. 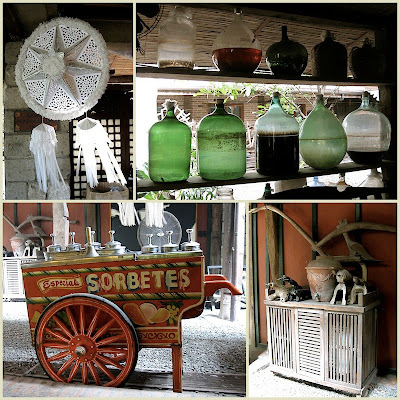 Collecting antique farm tools and cooking utensils is one of Claude's passions and as we continued to meander about, we came across even more unique items he has accumulated and displayed in an equally unique space. In the kitchen, a long rack filled with a fascinating array of antique spoons, ladles and other tools hung above a very utilitarian sink, while across the way, large carved platters were mounted alongside a hearth and chimney. Bale Dutung's open kitchen is just that, in the truest sense: not only can guests saunter freely through the area, the divide between inside and outside is marked only by a stand of palayoks, or clay cooking pots, and a variety of blackened pans and woven baskets hanging overhead. Just past them and under the open sky, we watched as a kitchen staffer stood over a no-frills grill, turning and basting skewers of chicken as fragrant smoke billowed above, and the sound of sizzling fat and the sharp aroma of marinade suddenly awakened our appetites. There was so much to see, we had nearly forgotten that we were there to eat! We quickly took our places at one of several long tables, which were beautifully set with brightly colored linens and centerpieces of vivid orange blossoms, freshly cut just moments before in the kitchen by a young woman who told me that they were santan (although they may actually be saraca tree flowers). Small votives were set inside pottery to heat fragrant oils that lightly perfumed the air, while bottles of Claude's specialty sauces and marinades, which we would be sampling, were placed alongside them. No other condiments graced the table, hinting that all the flavor that we were seeking might be found already well-infused in the dishes. Then, our hostess Mary Ann Tayag appeared, looking lovely in a crisp white blouse and printed sarong skirt. As the waitstaff placed glasses of refreshing juice by each setting, Mary Ann introduced herself and offered a warm, charming welcome to her home. Reminding us that we were about to embark on a 10-course, hours-long meal, she encouraged us not to rush through the food and assured with a smile that she was there to help: "You're in my house - I will pace you!" Before she left our table to welcome the other parties, she invited us to try Bale Dutung's welcome beverage of dalandan juice and 'dirty ice' - ice cubes made with muscavado sugar. Bale Dutung is open only by reservation, required well in advance and preferably for large groups. The menu consists of three multi-course sets, chosen in advance and served to the whole party. For more details on the menu, reservations, contact information and directions, please visit the Bale Dutung website. Our Bale Dutung meal kicked off with a cool, refreshing glass of dalandan juice. The deep green peel of this citrus makes it look like a large lime on the outside, but its bright orange interior is definitely, well, orange-like. This split personality is further exacerbated by the confusion surrounding its scientific classification: while some have categorized dalandans as Citrus aurantium, a.k.a. bitter oranges (which include the Sevilla), others place it under C. sinensis, to which navel oranges belong. Still others lump it with mandarins under C. reticulata. Whatever it's called, I find this sweet fruit to be a little less acidic than other types of orange juice. Bale Dutung's 'welcome drink' contained what Mary Ann called 'dirty ice' - ice cubes made of water and muscovado sugar, a minimally processed cane sugar that has retained its natural molasses. As the cubes melted, the drink was gradually infused with a pleasantly rich caramel flavor. Our hostess also noted that 'dirty ice' would make a great addition to cocktails, at which I immediately perked up. Just as soon as Mr. Noodle and I returned home, I decided to make my own rum-spiked 'welcome drink': a Dirty Ice Cocktail. Using a 1 to 2 ratio* of sugar to water, place ingredients in a small saucepan over medium heat and stir well. Continue stirring as the mixture heats up, until the sugar is dissolved. Let cool for a few minutes, then pour into an ice cube tray and freeze until needed. *Unfortunately, the mixture did not fully freeze, resulting in a firm slushy cube that quickly melted, and I suspect that my ration was too high on the sugar end. I have yet to try it again with a 1 to 4 ratio, so please let me know if you find a measurement that will yield a more standard ice cube. In a highball glass, add equal amounts of dirty ice and regular ice cubes. Pour equal measures of juice, tonic water and rum, and stir well. Feel free to adjust ratios to taste. Again, probably due to a flawed ratio of sugar to water, my version of dirty ice cubes was more 'slushy cubes'. As a result, they melted quickly when placed in the cocktail. On the bright side, they formed a nice layer of sweet caramel flavor which, when stirred into the drink, gave the cocktail a deeper, richer taste. Please check back for Part II of our Bale Dutung experience and the main course...! This is in my bucket list of places to go when I go home. I was supposed to go there last Sept., but you know what happened. I've seen so many pictures from my family and friends over there but I would like to see through your lenses. Can't wait! Tracey, I can't wait to read more of your experience at Bale Dutung. One of my dreams is to dine there when I finally make it back to Philippines. The dirty ice is a great idea I will have to borrow, perhaps with kalamansi-aide? I am not usually into restaurant reviews-given where I live it unlikely any restaurant is being reviewed that I can go to. But yours has me waiting with bated breath! Sounds fascinating and so much fun. i was about to say, I want more! I want more! when i saw that there's a part 2. the place is so surreal, so authentic. I rapture! Fascinating for sure! That cocktail looks very intriguing and i can't wait to hear more about this! Kat - Hehe! I am so bad - I'm here AFTER I replied to your comment on the subsequent post. Happy you enjoyed them! This is a fabulous post! Can't wait to go back home and try this place. I am a big fan of Claude and his wife and "darleng" Mary Ann. Thanks for sharing!